Alexander Gray Associates was pleased to debut recent self-portraits by Joan Semmel, in the Gallery’s first solo exhibition with this acclaimed artist. 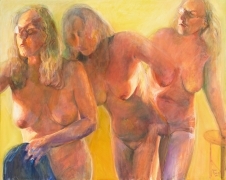 Working consistently with figurative painting for over four decades, Semmel is primarily associated with the establishment of the Feminist art movement in the 1970s. In the exhibition at Alexander Gray Associates, recent paintings continue the artist’s exploration of self-portraiture and female identity. The selected works represent the artist’s body, doubled, fragmented, and in-motion. Dissolving the space between artist and model, viewer and subject, these paintings are notable for their celebration of color and flesh. Soft and milky colors provide background for the luminous skin tones Semmel captures, as figure and ground merge. In many of the works, the artist confronts the viewer with a direct gaze, a departure from iconic earlier works in which the point of view that remained lay within the canvas itself.